The Russian arms manufacturer is preparing to undergo large-scale modernization with new technology that will help reduce labor costs and generate profits. Almost 5 billion rubles ($126 million) is to be invested in modernizing the Kalashnikov Concern by 2017, according to Sergei Chemezov, head of state-run corporation Rostec, which includes Kalashnikov. According to the news agancy ITAR-TASS, Kalashnikov has already launched a modernization program at its factory in Izhevsk, Udmurtia, which is about 750 miles east of Moscow. Kalashnikov’s plans include updating its machine tools and converting to new technology, namely MIM (metal injection moulding) technology, which can produce complex parts. A balanced granulated mix of fine metal powders and polymeric binders are used as raw material for these parts, thanks to which the gun parts do not require further processing. Russia's new trade representative to the U.S., Alexander Stadnik, told news agency ITAR-TASS in mid-September that the average price of a Kalashnikov rifle in the U.S. on the resale market has already hit $1,500. Prior to the imposition of sanctions by the U.S., a rifle typically retailed at an off-the-shelf price of $600. These new technologies will boost labor productivity, reduce financial costs, and free up production space. As a result of modernizing, Kalashnikov plans to triple small arms production to 1.9 million guns per year, Rostec said. 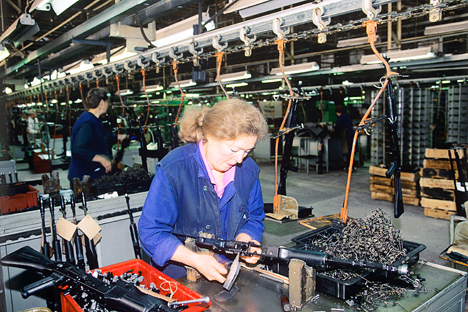 The technical upgrading program is the logical continuation of economic reforms at Kalashnikov. Rostec transferred 49 percent of the arms producer’s shares to private investors in 2013 in order to render its products more competitive. The plan has started to work – in the first half of 2014, small arms output more than doubled. The company anticipates more than 9 billion rubles ($226.7 million) in revenue in 2014, compared to over 2 billion rubles ($50.4 million) in 2013. In line with the development strategy for the small arms industry until 2020, which was jointly drafted by Rostec and the Russian Industry and Trade Ministry, revenue from small arms sales is slated to rise to 24 billion rubles ($604.6 million). Kalashnikov, which lost its traditional sales markets with the imposition of sanctions by the European Union and United States, will also change its export strategy with the introduction of new technology. According to Russian news agency ITAR-TASS, at the beginning of 2014 Kalashnikov and American company RWC (the official Kalashnikov dealer in the U.S.) signed a contract allowing the Russian company to supply up to 200,000 weapons a year to the U.S. and Canada. The lion’s share of civilian weapons manufactured by Kalashnikov was bought by the U.S. and Germany, which are now closed to its products. Kalashnikov’s management is seeking out new sales markets to compensate for the losses it incurred from the sanctions. “For example, [Kalashnikov is looking at] Latin America and the Asian and African countries. The development of these markets will make it possible to distribute the freed-up volumes of finished product and retain previous financial and production indicators,” Alexei Krivoruchko, an investor in Kalashnikov, told journalists. For civilian markets, the concern is developing three new hunting rifle and shotgun models based on the Kalashnikov rifle: the Saiga-MK107, Saiga-9, and Saiga-12 Model 340, which will go into mass production this year. However, Kalashnikov has not forgotten about its traditional niche: military rifles. At the moment, the concern is developing the latest AK-12 chambered in 7.62x39mm, in the interests of the Russian Ministry of Defense. The Ministry of Defense is scheduled in October to make a final selection of the basic shooting kit that will form part of the standard Russian equipment package for the ‘soldier of the future’, named Ratnik (‘warrior’ in English). The ministry is to choose between the AK-12 and the AEK-71, the latter produced by the Degtyarev Kovrov Mechanical Plant. These rifles are a reflection of two different concepts for improving individual military arms, independent small arms expert Semyon Fedoseyev told RIR. Like its predecessors, the AK-12 is designed using a gas-operated long-stroke piston system. This scheme has a negative impact on shooting accuracy, although several measures have been adopted to improve the AK-12, including better ergonomics, a modified barrel, a receiver, action, and new protective coverings, all while keeping the comparatively low production cost down. Fedoseyev said the AEK-971 has a higher shooting accuracy but a more complex structure. Its moving parts are divided into two sections - the bolt carrier and the recoil-balancing mechanism – which are connected by a rack and pinion to synchronize movement. As a result, the pulses of movement of the carrier and recoil-balancing mechanism cancel each other out, and the shooter only feels the recoil momentum of the shot. The rifle shifts much less during recoil. Both assault rifles have a 5.45 mm carbine, so no colossal spending will be necessary to replace the arsenal of ammunition, said Fedoseyev. There is currently no consensus among Russian military experts regarding which rifle should be provided for the ‘soldier of the future’. This means Kalashnikov will try to survive a difficult period of uncertainty by orienting itself towards the civilian market to the greatest possible extent.